What do the pharmacy team do? Pharmacy is an integral part of the research process and has a vital role in relation to clinical research, which is to safeguard participants, healthcare professionals and the Trust by ensuring Investigational Medicinal Products (IMP’s) are appropriate for use and are procured, handled, stored and used safely and correctly. The Pharmacy clinical trials team is a dedicated group of Pharmacists, Technicians and Support Officers who manage pharmacy's ongoing commitment, support and development of clinical trials. •	Advise on regulations and guidelines on good clinical practice and good manufacturing practice. are procured, handled, stored and used safely and correctly. 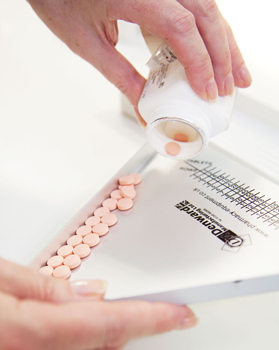 •	Monitor adherence to pharmaceutical criteria, such as previous or concurrent drug treatment. •	Provide Trust's clinical risk assessments of individual clinical trials. •	Provide pharmacy related sections for protocol, CRFs, IRAS, pharmacy manual etc.